Looking for something sweet to give as a gift this Valentine’s Day? 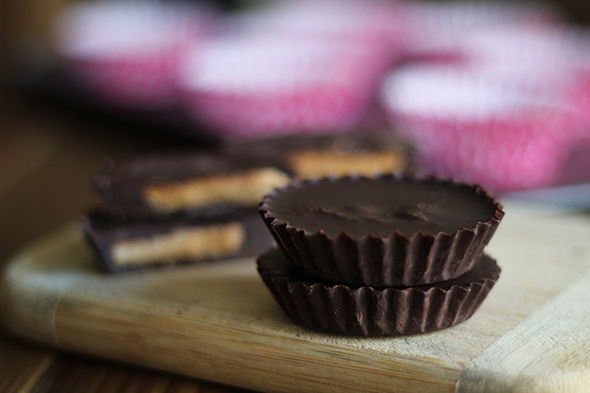 Try making some homemade peanut butter cups! It’s such an easy treat that only requires 3 basic ingredients: dark chocolate, peanut butter, and sea salt! Just pop the chocolate into a bowl and microwave for 30 seconds. Continue with 10-15 second intervals until melted (note: chocolate doesn’t need to be melted completely, if there are lumps – the residual heat will melt the rest once you mix). Place cupcake liners on a cookie sheet or muffin pan. Pour a thin layer of chocolate into each liner. Gently pat the sheet/pan a few times on the counter to flatten the surface. Place in fridge for 5-10 minutes. Scoop some peanut butter and place it in the center. Use a spoon to flatten out if necessary (make sure to leave room on the sides for the next layer of chocolate). Sprinkle some sea salt and it’s almost done! 4. Add Final Chocolate Layer! Add the final layer of melted chocolate. Pat the sheet/pan a few times on your surface to allow the chocolate to evenly cover the top and sides of each PB heap. Feel free to sprinkle some sea salt before placing in the fridge again for 15 minutes. It’s as simple as that. Try using different chocolates or nut butters for different flavor combinations! Yay! I’m making these for my brothers birthday with almond butter. He’s allergic to peanuts and with this recipe, he can finally try a “Reeses”!